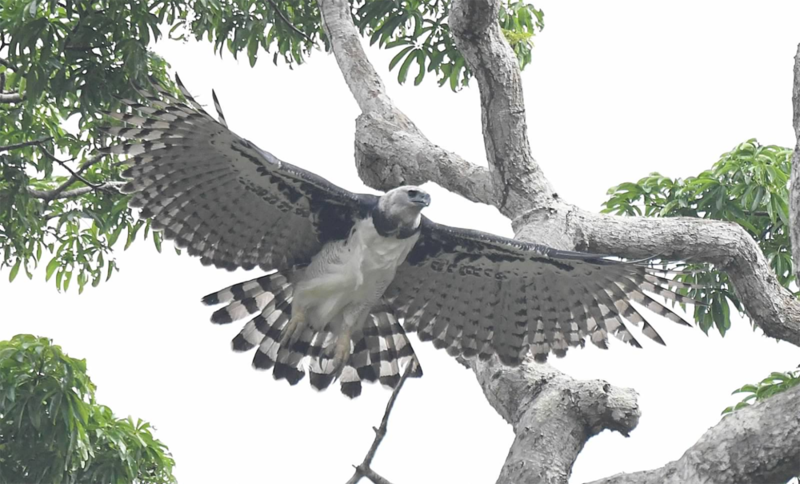 The majestic, elusive Harpy Eagle, the world’s biggest and most powerful bird of prey. The land price includes escorted transfers, excursions with a naturalist guide, entrance fees, accommodation in a simple but clean and air-conditioned hotel, Brazilian dinner on Day 1 and field breakfast on Day 2 (for 1-night tour) or Brazilian dinner on Day 1, field breakfast and field lunch on Day 2 and field breakfast on Day 3 (2-night tour), as well as all land transportation. All prices are per person based on two people sharing a guest room. An intial payment of 50% of the land price is requested to guarantee a reservation, with the balance payable two months before tour commencement. The standard form of payment is by wire transfer. If you prefer to use a credit card, there is a 3% surcharge, which is our cost of processing such transactions. Travel insurance is not included, and there are no refunds. Therefore, we strongly recommend that you purchase travel insurance by Travel Guard to protect yourself and your investment in the tour. No air tickets are included, nor do we sell any. The flights are best arranged through your international carrier or Expedia. 40 out of 40 full-day visits to our favorite Harpy nest yielded excellent sightings. Land at Alta Floresta Airport, where our guide will meet you and drive you to our Harpy Eagle Tower to watch for the 22-month-old juvenile female Harpy Eagle from the roomy deck atop our exclusive tower (or for those who do not like heights, view from good spots on the ground). Ever since we first started monitoring this huge eagle in June of 2017, the eagle has come to visit its nest tree on 85% of the afternoons and 95% of the mornings. It typically sits at 15 to 25 meters from our tower, calls for its mother and father for fifteen minutes, and if the parents do not call back, this full-grown female eagle flies off into the distance and disappears, presumably to hunt for itself or to look for its parents in other parts of their territory, which is probably about six kilometers in diameter. Based on our six months of daily observations at the nest tree, the probability of your seeing the eagle during the two-night expedition will be 99.999%. We are so sure of the very high probability of seeing the eagle that if you do not see the eagle at all, we will refund 100% of the ground costs of your itinerary. Our Harpy Eagle Tower, the only such tower in the world, is ergonomically designed with wide steps that are easy to walk up and walk down no matter how large your shoe size. Guests who do not enjoy heights can watch the eagle from the ground through our spotting scope, although the best views by far are from the top of the tower. Breakfast. At one hour before sunrise, we leave the hotel to drive 40 minutes back to the Harpy Eagle Tower and watch for the eagle again. We also will take substantial amounts of breakfast items into the field. The forest near the nest tree is in various states of management by the homesteaders who own the land. One ten-acre section of forest features a mix of palm trees and tall hardwood trees that attracts 30 to 100 large macaws each morning to forage on the palm nuts and other fruits. In fact, the partially-open structure of those 10 acres makes for spectacular viewing and photography of the macaws, which mostly are Blue-and-Gold and Scarlet, though Red-and-Green fly by in smaller numbers each day. We have built a series of trails into this open woodland palm forest to allow easy access to photograph and observe the macaws and other birds. We also have other simple trails in different patches of forest within 500 metres of the nest, and each has an interesting mixture of forest birds. Thus, after the eagle’s morning or afternoon visit, we then can explore the trails in the open palm woodland and more closed forest types to build an excellent bird list. 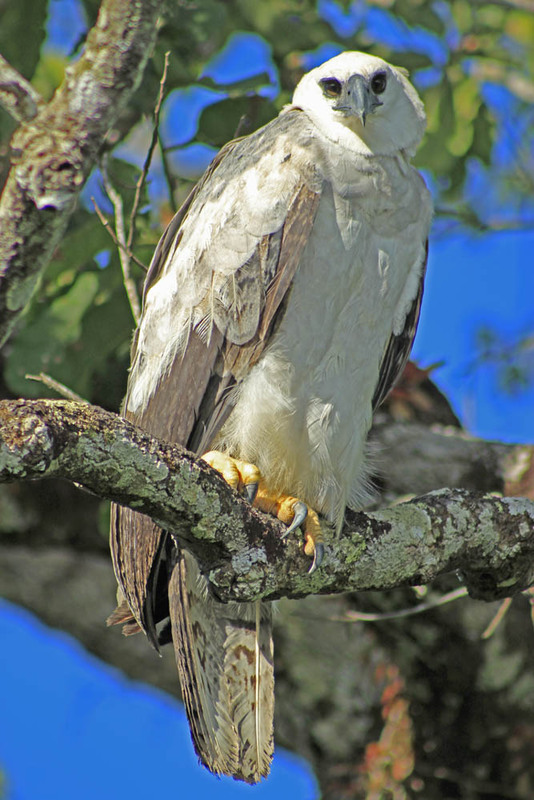 A highly experienced bird tour company owner visited our forest and concluded that not only is the eagle spectacular, but the forest birding there is so good that he considers it a primary birding location, even if there were not a resident, habituated, full-grown female eagle visiting its old nest tree twice a day. Return to Paranaita for lunch and for a rest in your air conditioned rooms. At approximately 2:00 pm, return to the tower to try to see the eagle again. Once the eagle has visited and left, or once we conclude that the eagle will not visit that afternoon, we go birding and macaw-watching again on the trails within a few hundred meters of the nest tree. At sunset, which normally is close to 6 pm, drive back to the hotel. Dinner at Charoles and early to bed. Overnight at Hotel Ríos. B, L, D.
Breakfast very early, and drive to the Harpy Eagle Tower for a final chance to see the eagle and to bird the trails nearby. Once again, we offer substantial amounts of breakfast items in the field in case you were not hungry before leaving the hotel. By no later than 10:15 am, we leave the tower to drive straight to the city of Alta Floresta. When we arrive, our guide will take you to a good restaurant, where you can choose and pay for your own lunch. We should arrive at the restaurant no later than 11:30 am and finish lunch by 12:30 pm. Then drive five minutes to the airport to check in at 12:45 pm for the one-hour Azul Airlines flight back to Cuiabá. View the Harpies from the top of our 25-meter-tall Harpy Tower. 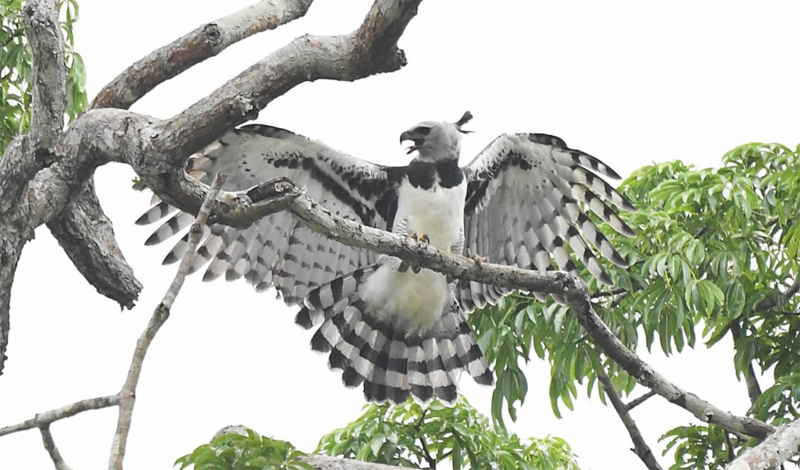 Every birder, wildlife lover, and wildlife photographer on Earth wishes to see the majestic, elusive Harpy Eagle, the world’s most powerful bird of prey. Until now, it has been extremely difficult to see this amazing raptor, so difficult in fact that a traveler spending even ten days in the wildest parts of the Amazon rainforest such as Manú or Jaú National Park has less than a one-in-twenty chance of seeing a Harpy Eagle, and less than one chance in ten thousand of taking excellent photos of this spectacular bird. All that has changed thanks to our Harpy Eagle Expedition. 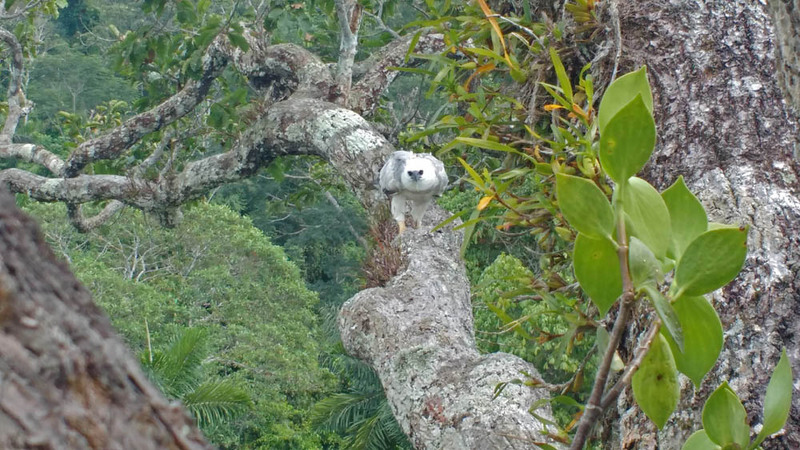 After years of searching, our scientific advisor’s team of biologists has found a series of Harpy Eagle nests near Alta Floresta, in the southern Amazon of Brazil. Only one hour by air and one hour by car from Cuiabá, an expedition to our favorite nest combines perfectly with our Jaguar Extreme. The Harpies at our nests are completely unafraid of humans. We have six active Harpy nests located in northern Mato Grosso State, Brazil under our exclusive management. All of these nests lie within a half-day drive of Alta Floresta, an easily-accessible, modern city that is reachable in only one hour by commercial flights from the “Jaguar Capital of the World”, Cuiabá. Our favorite nest at the moment is located only one hour by car from Alta Floresta. But if you want to visit other nests, located 5 to 7 hours by road and river from Alta Floresta, plan to spent at least three nights. At the nest only one hour outside of town, we currently offer viewing of the Harpies from the top of our custom-built, 25-meter-tall Harpy Tower. Access to the top of the tower, located just 25 meters from the nest, is by walking up low-rise, conventional stairs that are easy to use. The most famous Harpy researchers act as behavioral consultants to ensure the safety of the birds. Thanks to years of careful habituation, the Harpies at our nests are completely unafraid of humans and do not mind being observed and photographed from as little as 20-35 meters away. To ensure the safety of the birds, for many years now the most famous PhD Harpy researchers, Eduardo Alvarez and Alexander Blanco, have been our main behavioral consultants. From 1990 until the present, Drs. Alvarez and Blanco have managed 20 Harpy nests for international TV documentaries and for private photographers. In May 2017, Dr. Blanco gained much-deserved international recognition when he was awarded the highly-prestigious Whitley Award for wildlife conservation, thanks to his pioneering work in conserving Harpy Eagles in his native Venezuela. 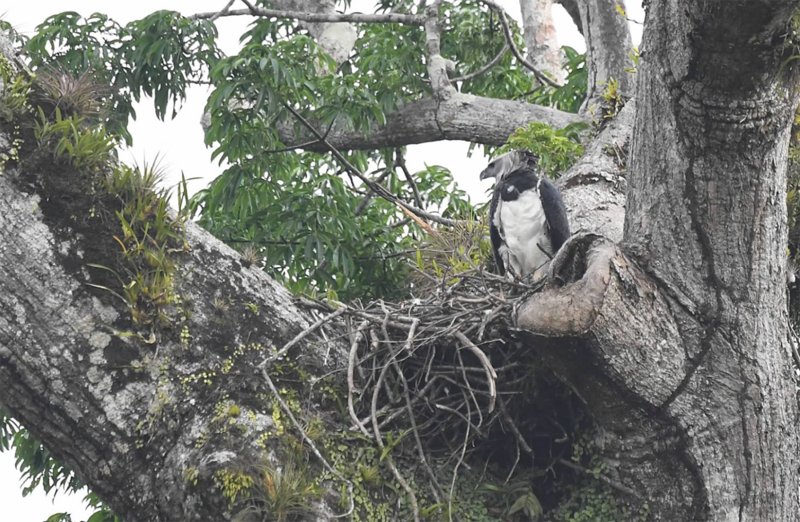 Our Harpy Eagle Expedition will always offer the best lodging that one can reach in a manageably short period of time to get to the nest each day by dawn and to leave the nest no earlier than sunset. Currently, we are offering acceptable, air-conditioned hotels in Alta Floresta or in another, smaller city that is 25 minutes closer to the closest nest. In the case of the second nest that we are bringing on line in July 2017, we have secured air-conditioned lodging within a 40-minute drive. 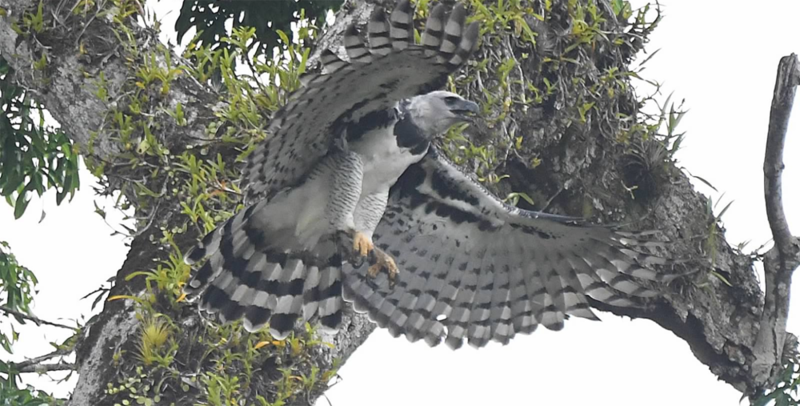 All of our Harpy Eagle Expeditions include an English-speaking naturalist guide, specified meals and excursions, private transportion, field bathroom at the observation platform or tower, unlimited water in the field, and our unique Harpy Guarantee. 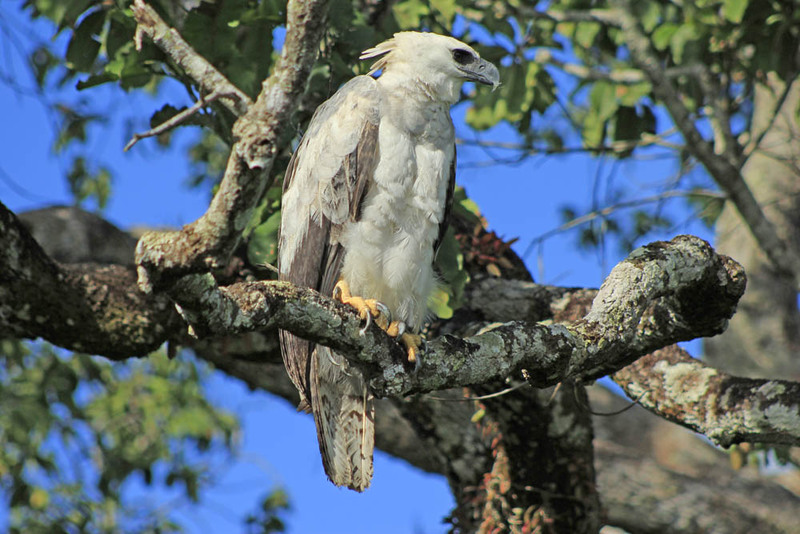 Our guarantee states that if you do not see a perched Harpy Eagle at all during your expedition, we will refund 100% of the ground costs of your expedition. Not included: flights, meals not specified in the itinerary, extra expenses, tips, soft drinks, small bottles of water, beer, wine, mixed drinks, laundry and travel insurance for guests who reside outside of the United States. The guarantee is a 100% refund of the price you paid for the Harpy Eagle Expedition. It does not include the cost of any flights or other expenses. The guarantee applies even to a one-night expedition if you: 1) Land at the Alta Floresta Airport already wearing your permethrinized trousers, socks and shoes. 2) Proceed immediately to the Harpy Tower after claiming your baggage (however, if you come out of baggage claim more than 50 minutes after the scheduled arrival time, the guarantee is reduced to a 50% refund). 3) Stay at the base or on the tower as instructed by your guide until 15 minutes past sunset. 4) Be willing to walk within a 300-meter radius of the nest tree to see the juvenile on some of its other favorite trees. 5) Allow us to pick you up 90 minutes before sunrise the next day to take you back to the nest tree if we did not find a Harpy Eagle for you on the first afternoon. 6) Stay at the nest tree area until two-and-one-half hours before your flight departs. First and last photos were taken with a 300 mm lens.